This morning, the gears of the Twitter joke mill received their daily greasing when a Fox Business interview clip surfaced online of President Donald Trump rapturously recalling eating the “most beautiful piece of chocolate cake” before forgetting what country he was bombing at the time. It defied all human empathy—how could Trump recall what he had for dessert while forgetting that it was the people of Syria, not Iraq, whose blood he was about to shed? Is he really that heartless, that selfish, that senile? All possibilities. But, as it turns out, there’s another reason why Trump was able to remember that cake so well. Like all of his favorite things, it has his name on it. 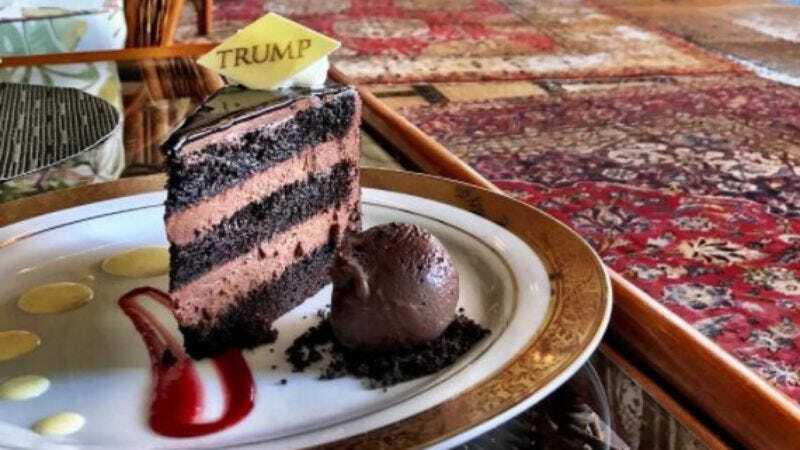 The “three layer Trump chocolate cake” is just one of a handful of Trump-themed menu items available at his Mar-A-Lago resort in Palm Beach, Florida; there’s also “Mr. Trump’s wedge salad,” which was served alongside the chocolate cake on Thanksgiving at the club. Any symbolism in the red smear of raspberry sauce on the plate under the decadent chocolate treat is, presumably, unintentional.